These days there is barely anyone who does not dream of perfect body. Well, it is pretty obvious, since everyone around us, on the TV or in the magazines, turns out to look perfect. Yet, there are many things people leave behind while trying to get perfectly fit. The thing is that apart from looking perfect it is important to be healthy. While most people involve usual sit-ups and crunches into their workout routines, experts say that there is more harm than use from them. In case you wonder why, you should think about your back for a moment. Once you realize that there is no easier way to hurt your back than while doing improper sit-ups or crunches, there will be no way you will spent countless minutes on repeating them. Fine, we crossed these two, claimed to be effective, exercise out – what next? 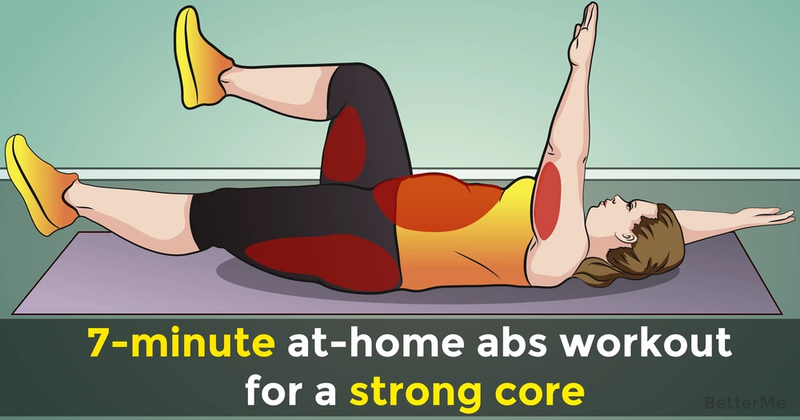 What is there to do to achieve perfectly strong core and abs at home, without crunches and sit-ups? That is what we are going to talk about today what is more we are planning to introduce to your attention a set of exercises, which will take you only 7 minutes to carry out and perfect result to look at. Just before we start, we would like to remind you that in order to achieve a perfect result, there is something more that effective workout needed. As you may have guessed, what we have in mind is a healthy diet. Trust us, it does not take that much to switch to a healthy side! #5. Torso Twist with Ball.